Boom 8,8 - 29,0 m. Four-section, synchronized full power boom. Maximum tip height: 31,2 m.
*Fixed swingaway extension 7,9m - 13,7m offsettable swingaway extension. Offsets at 0° and 30°. Stows alongside base boom section. Maximum tip height: 38,9 m.
*Telescopic swingaway extension 7,9 m - 13,7 m offsettable telescopic swingaway extension. Offsets at 0° and 30°. Stows alongside base boom section. Maximum tip height: 45,0 m.
Boom nose Three nylatron sheaves mounted on heavy duty tapered roller bearings with removable pin-type rope guards. Quick reeve type boom nose. Boom elevation One double acting hydraulic cylinder with integral holding valve provides elevation from -3° to +76°. Cab Full vision, all steel fabricated with acoustical lining and tinted safety glass throughout. Deluxe seat incorporates armrest-mounted electric dual-axis controllers. Dash panel incorporates gauges for all engine functions. Other standard features include: tilt steering wheel, hot water heater, cab circulating air fan, air conditioning, sliding side and rear windows, sliding skylight with electric wiper and sunscreen, electric windshield wash/wipe, fire extinguisher and seat belt. Slewing Single speed, planetary swing drive with foot applied multi-disc wet brake. Spring applied, hydraulically released swing brake. Single position mechanical house lock, operated from cab. Maximum speed: 2,0 RPM. Hydraulic system Two main pumps ( piston and  gear) with a combined capacity of 316,5 LPM. Maximum operating pressure: 275,7 bar. Three section pressure compensated valve bank. Return line type filter with full flow by-pass protection and service indicator. Replaceable cartridge with micron filtration rating of 5/12/16. 396 L hyd. reservoir. System pressure test ports. • 1st layer: 5 280 kg. • 3rd layer: 4 323 kg. • 5th layer: 3 656 kg. Maximum Permissible Line Pull: 5 280 kg. with 34x37 class rope. Maximum Single Line Speed: 136 m/min. Rope Construction: 34w x K7, special flexible. Rope Diameter: 16mm. 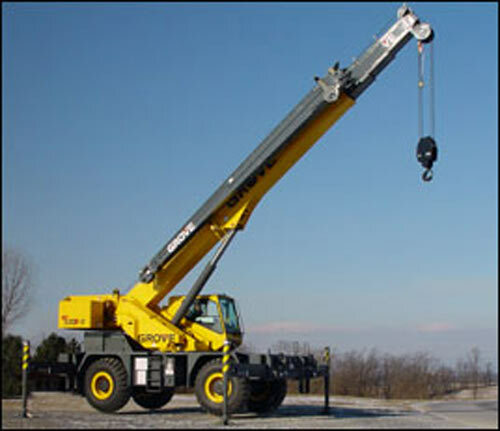 Rope Length: Main Hoist: 137 m - Auxiliary Hoist: 137 m. Maximum Rope Stowage: 181 m.
Chassis Box section frame fabricated from high-strength, low alloy steel. Front/rear towing and tie down lugs. Engine Engine (Tier III): Cummins QSB 6,7 L diesel, six cylinders, 160 CV, 119 kW (Gross) at 2500 rpm. Maximum torque: 732 Nm at 1500 rpm. Fuel tank capacity: 219 l. Engine (Tier IV): Cummins QSB 6.7 L diesel, six cylinders, turbocharged with Cummins Diesel Oxidation Catalyst filter/muffler. Meets emissions per U.S.E.P.A. Tier IV and E.U. Stage III B. 122 kW at 2300 rpm. Maximum torque: 731 Nm at 1500 rpm. Fuel requirement: Maximum of 15 ppm sulphur content (Ultra Low Diesel Fuel). Note: Tier IV engine Required in North American, Canada, and European Union countries. Transmission Range-shift 6 speed (3 speeds x 2 range, both forward & reverse). Front axle disconnect for 4 x 2 travel. Drive/Steer 4 x 4. Fully independent power steering: Front: Full hydraulic steering wheel controlled. Rear: Full hydraulic switch controlled. Provides infinite variations of 4 main steering modes: front only, rear only, crab and coordinated. Rear steer indicator. Outside turning radius 5,80 m. Inside turning radius: 4,00 m.
Axles Front: Drive/steer with differential and planetary reduction hubs rigid mounted to frame. Rear: Drive/steer with differential and planetary reduction hubs pivot mounted to frame. Brakes Full hydraulic split circuit disc-type brakes operating on all wheels. Spring-applied, hydraulically released parking brake mounted on front axle. Tyres Std. 20,5 x 25 - 24 bias ply. Option: 16,0 x 25-28 bias ply. Maximum Speed 40 km/h at 2500 r.p.m.